This title seems taken right out from the world of Utopia. I said seems. What would it take for our world to start on this road toward happiness for all? For the last 3000 years we were presented different theories, religions, recipes that, we thought, would eventually allow just that: happiness for all. Now in 2015 we have to agree; it didn’t work. I do not need to paint the world as it is now as we all know the picture isn’t pink, unless I attribute this color to cancer. We have to pause again and look around us. Although the natural world is in dire state thanks to human thoughtless actions, we can still see that it is intelligently organized and that it is because of this organization that nature reacts the way it does. The model behind this organization is the one on which the human brain developed. It therefore holds the key to happiness. Contrary to many behaviorists, feminists or sociologists, I do not say that the male brain is different from the female brain because “men are from wars and hunts and women are from gardens and care”. Indeed, other primates and mammals carry the same structural differences between male and female brains. Human actions didn’t create the organization of the human brain, the model behind nature did. I say male and female brains are different because “male” and “female” have different and complementary functions beyond the genital, material aspect. Energy and organization precedes matter and how it is expressed. That is to say that right at the beginning the perception of the world from a little girl or a little boy standpoint are different. Their needs differ also. So we ought to understand these differences as well as find their common point if we want both to find and cultivate happiness in their lives. This, for the last 3000 years, many philosophers discussed, followed by countless of individuals. Lately though, two point of view have been largely popularized: those of psychoanalysts Sigmund Freud and Carl Gustav Jung. The first point of view leads to the release of subconscious patterns mainly through the unleashing of sexual energies, within the theory that this would allow freedom and psychological health. This is a masculine standpoint. The second took a curve to avoid the cul-de-sac resulting from the first approach and sensed that we must lead humans to the the expression of their inner identity in order to free them from the material world. This is a feminine standpoint. 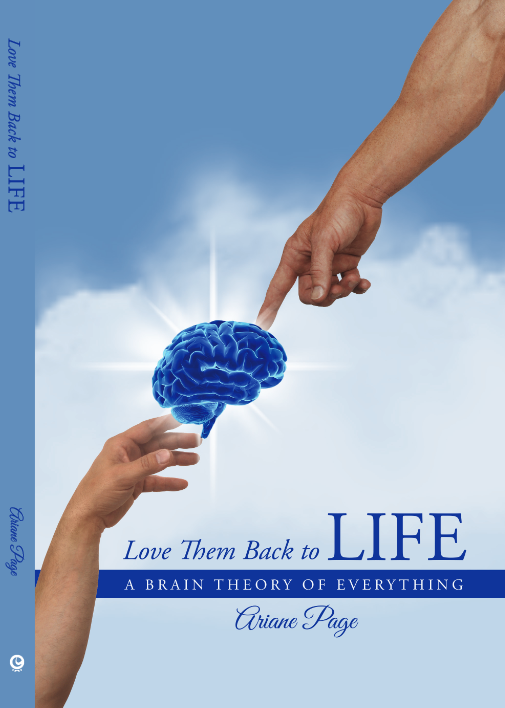 This is what the front cover of Love Them Back to LIFE expresses, understood through new results from research on the brain. These two arms are from Michelangelo’s painting, Creation of Adam, adorning the Sistine Chapel ceiling. The lower arm is that of Adam or humanity. The top arm belongs to God or the archetypal world. Adam has an effect on the aspect of life associated to mortality: food, environment, the physical, the emotional, actions. It directly affects our perception of the world and its tool, our physical being, allowing us to survive in this world. Adam or humanity has control over the physical regulator of his own existence. In the same way, I have control over my personality. My perception of God, or of the archetypal world affects how I define my identity: the mental and social. Not only does it affects my perception of the world around me but it also controls the physical regulator of my life. My actions, my eating habits, my relationships ; it influences my whole life. Adam is associated to our personality and develops from conception to 14 years old. The individuality, associated to the archetypal world develops on top of this personality between 14 and 28 years old. This is why parents have such a permanent influence over their children. If we want happiness for all, it seems essential to understand not only our structures but the functions of these structures in humans and most of all the model behind both. As we begin 2015, I wish for all to understand this model and therefore to have a better grasp over life. Then only will we clearly see what is important and what is not. Then through our choices we will march together, as one, on the road towards happiness for all.